Mailbox Monday, created by Marcia at To Be Continued, formerly The Printed Page, has a permanent home at its own blog. To check out what everyone has received over the last week, visit the blog and check out the links. Leave yours too. Also, each week, Leslie, Vicki, and I will share the Books that Caught Our Eye from everyone’s weekly links. 1. 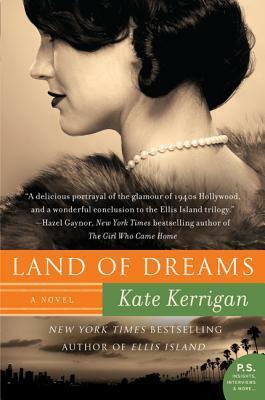 Land of Dreams by Kate Kerrigan for review for TLC Book Tours. Irish immigrant Ellie Hogan has finally achieved the American Dream. But her comfortable bohemian life on Fire Island, New York, is shattered when her eldest adopted son, Leo, runs away, lured by the promise of fortune and fame in Hollywood. Determined to keep her family intact, Ellie follows him west, uprooting her youngest son and long-time friend Bridie. In Los Angeles, Ellie creates a fashionable new home among the city’s celebrities, artists, and movie moguls. She is also drawn into intense new friendships, including talented film composer Stan, a man far different from any she has ever met, and Suri, a beautiful Japanese woman and kindred spirit, who opens Ellie’s eyes to the injustices of her country. 2. 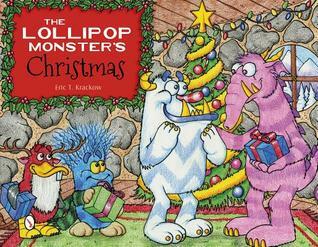 The Lollipop Monster’s Christmas by Eric T. Krackow and Heather M. Krackow for review. Larry’s favorite time of the year has arrived. He races around his home trying to make everything perfect before his friends arrive for Christmas morning. During the celebration, he discovers a lonely monster named Walter, who is very sad. Larry asks him why he is sad and Walter explains that Christmas is a difficult time of the year because he is always alone and has no family. Larry invites him to spend the holiday with him and his friends. Walter shyly accepts the invitation and follows Larry back to his home. Walter is welcomed by Larry’s friends and ends up having the most merry Christmas ever! 3. 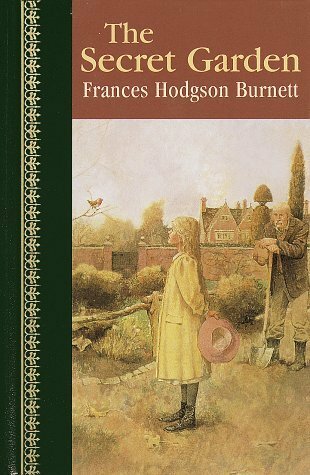 The Secret Garden by Frances Hodgson Burnett, illustrated by Kathy Mitchell from the library sale. What secrets lie behind the doors at Misselthwaite Manor? Recently arrived at her uncle’s estate, orphaned Mary Lennox is spoiled, sickly, and certain she won’t enjoy living there. Then she discovers the arched doorway into an overgrown garden, shut up since the death of her aunt ten years earlier. Mary soon begins transforming it into a thing of beauty–unaware that she is changing too. But Misselthwaite hides another secret, as mary discovers one night. High in a dark room, away from the rest of the house, lies her young cousin, Colin, who believes he is an incurable invalid, destined to die young. His tantrums are so frightful, no one can reason with him. If only, Mary hopes, she can get Colin to love the secret garden as much as she does, its magic will work wonders on him. 4. Haroun and the Sea of Stories by Salman Rushdie from the library sale. Immediately forget any preconceptions you may have about Salman Rushdie and the controversy that has swirled around his million-dollar head. You should instead know that he is one of the best contemporary writers of fables and parables, from any culture. 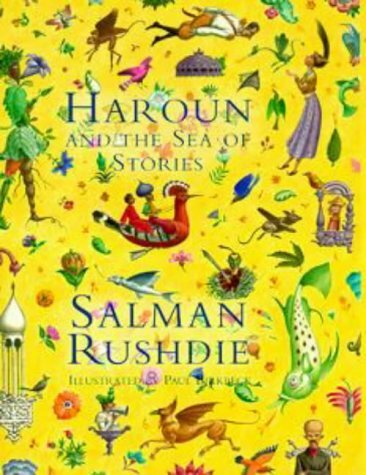 Haroun and the Sea of Stories is a delightful tale about a storyteller who loses his skill and a struggle against mysterious forces attempting to block the seas of inspiration from which all stories are derived. 5. 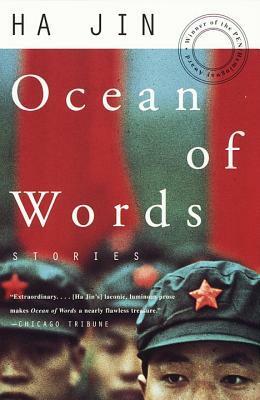 Ocean of Words by Ha Jin from the library sale. The place is the chilly border between Russia and China. The time is the early 1970s when the two giants were poised on the brink of war. And the characters in this thrilling collection of stories are Chinese soldiers who must constantly scrutinize the enemy even as they themselves are watched for signs of the fatal disease of bourgeois liberalism. In Ocean of Words, the Chinese writer Ha Jin explores the predicament of these simple, barely literate men with breathtaking concision and humanity. From amorous telegraphers to a pugnacious militiaman, from an inscrutable Russian prisoner to an effeminate but enthusiastic recruit, Ha Jin’s characters possess a depth and liveliness that suggest Isaac Babel’s Cossacks and Tim O’Brien’s GIs. 6. 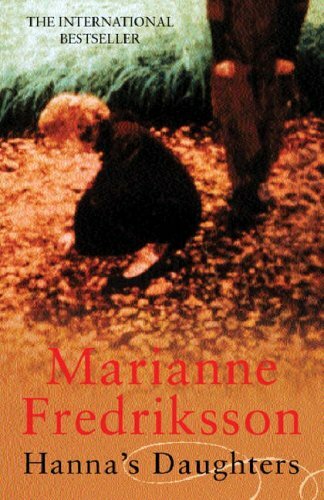 Hanna’s Daughters by Marianne Fredriksson, translated by Joan Tate from the library sale. Anna has returned from visiting her mother. Restless and unable to sleep, she wanders through her parents’ house, revisiting the scenes of her childhood. In a cupboard drawer, folded and pushed away from sight, she finds a sepia photograph of her grandmother, Hanna, whom she remembers as old and forbidding, a silent stranger enveloped in a huge pleated black dress. Now, looking at the features Anna recognises as her own, she realises she is looking at a different woman from the one of her memory. Set against the majestic isolation of the Scandinavian lakes and mountains, this is more than a story of three Swedish women. It is a moving testament of a time forgotten and an epic romance in every sense of the word. 7. 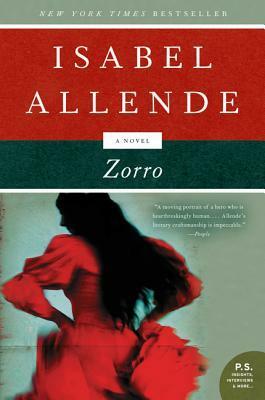 Zorro by Isabel Allende from the library sale. A child of two worlds—the son of an aristocratic Spanish military man turned landowner and a Shoshone warrior woman—young Diego de la Vega cannot silently bear the brutal injustices visited upon the helpless in late-eighteenth-century California. And so a great hero is born—skilled in athleticism and dazzling swordplay, his persona formed between the Old World and the New—the legend known as Zorro. 8. Those Who Saved Us by Jenna Blum from the library sale. For fifty years, Anna Schlemmer has refused to talk about her life in Germany during World War II. Her daughter, Trudy, was only three when she and her mother were liberated by an American soldier and went to live with him in Minnesota. Trudy’s sole evidence of the past is an old photograph: a family portrait showing Anna, Trudy, and a Nazi officer, the Obersturmfuhrer of Buchenwald. Driven by the guilt of her heritage, Trudy, now a professor of German history, begins investigating the past and finally unearths the dramatic and heartbreaking truth of her mother’s life. Combining a passionate, doomed love story, a vivid evocation of life during the war, and a poignant mother/daughter drama, Those Who Save Us is a profound exploration of what we endure to survive and the legacy of shame. 9. W.B. Yeats Selected Poems from the library sale. Nobel Prize winner W.B. 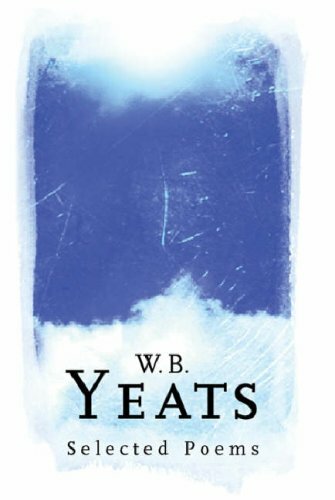 Yeats laid the foundations for an Irish literary revival, drawing inspiration from his country’s folklore, the occult, and Celtic philosophy. A writer of both poems and plays, he helped found Dublin’s famed Abbey Theatre. The poems here provide an example of his life’s work and artistry, beginning with verses such as “The Stolen Child” from his debut collection “Crossways “(written when he was 24) through “Why Should Not Old Men Be Mad?” from “On the Boiler,” published a year prior to his death. 10. Hello, Baby! (Amazing Baby) by Beth Harwood, illustrated by Mike Jolley and Emma Dodd from the library sale. Slide the slider, and say hello, baby! Littleones will love the peek-a-boo slider as youshare the story of some baby friends and their mothers who say hello. Captivating patterns like checkers and stripes, and fascinating animals like bright yellow ducks and big woolly sheep are guaranteed to keep little ones entertained. Share the fun of discovery with your amazing baby! 11. Alphabet by Matthew Van Fleet from the library sale. 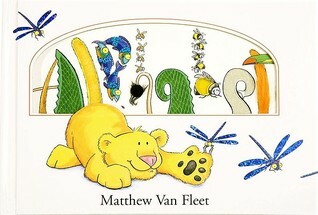 In Matthew Van Fleet’s incredible new multiconcept book, over 100 creatures and plants from A to Z hilariously demonstrate action words, synonyms, opposites, and more. Young explorers are challenged to spot four plants or animals that begin with each letter of the alphabet. Twenty-three textures plus foils, flaps, pull tabs, and even a scratch-and-sniff scent add to the interactive surprises on every page. 12. Play Me Another Song Piano Book by Jimmy Tanka and Jimmy Tanaka from the library sale. A 24-page board book (10 1/4″ 10 1/8″)- an electronic keyboard with replaceable batteries and color-coded numbered keys- easy-to-follow musical notation- 12 songs: Row, Row, Row Your Boat; Yankee Doodle; Happy Birthday to You; It’s Raining, It’s Pouring; Hot Cross Buns; Humpty Dumpty; Rock-a-bye Baby; Hey, Diddle Diddle; Mary Had a Little Lamb; Pat-a-Cake; Little Miss Muffet; Old MacDonald- ideal for traveling.